I’m using Chrome for both my desktop and mobile usage. I have been using them every since they were launched. Because of only one reason – “Google“. I really loved the way this browser is connected with Google products. I have a personal Chrome account, where I keep important bookmarks and history details. I do the same for desktop and mobile. But for the past few months I have been using “Chrome for Android” more than “Chrome for Desktop”, I’m carrying my phone all the time and using it to browse the web often. Google Chrome is really simple but at the same time it is kinda sluggish. I hate that a lot when it comes to browsing. I tried using some other browsers but I always miss the ‘Chrome’ experience. Fortunately I came across an interesting Reddit thread where an user shared a simple tip to improve the performance. Don’t worry, it is not rocket science, I’ll explain them below with a screenshot. 2. You’ll now see “Maximum tiles for interest area” section. From the dropdown list, change the value from ‘Default’ to ‘512’. At the bottom you’ll see “Relaunch Now” button, click on it. That’s all. 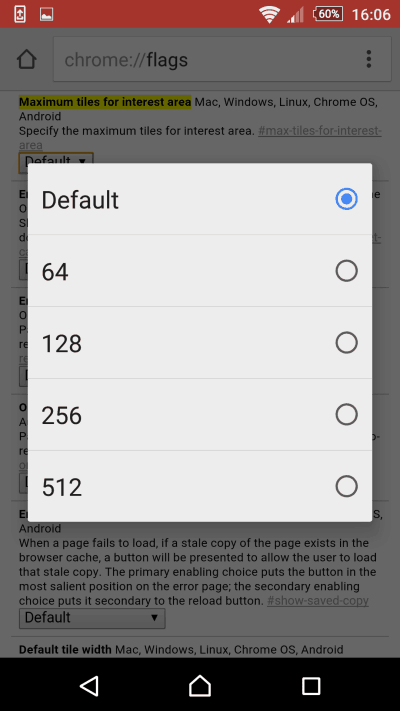 2 simple steps to speed up Chrome for Android. You can also try experimenting by changing the values to ‘256’ and other values as well. Basically this change will allow the browser to use more RAM and reduce the drop in frame rates. I’m not saying this just for the sake I wrote this post, but I honestly felt a difference. My Chrome browser for Android became less sluggish and more responsive. We’ll be back with more such tips on our next post. Do try this simple hack/trip for your Android Chrome browser and let us know your views in the comments below. I’m the CEO & Founder of Slashsquare, an Indian Blog Network & Web Consulting Media. I’m a Blogger, an Internet Marketer, and a Minimalist. DeviceBAR is a part of Slashsquare network. Google Chrome + Adobe = Better Laptop Battery Life? You can comment using your Facebook Profile too!